The navigational deflector is designed to sweep dangerous particles, ranging in size from single atoms of hydrogen to small asteroids, from the path of a starship while traveling at relativistic velocities or warp speed. Without the navigation deflector even the smallest practical could possess large amounts of energy causing extreme damage to a ship s hull integrity if a collision were to take place. The navigation deflector is normally mounted on the front of the secondary hull on Federation starships in a large dish shape depression. The deflector system consists of redundant graviton polarity generators that supply subspace field distor tion amplifiers. Mounted directly behind the deflector are the long range sensors that are used in conjunction with the deflector to scan for objects along the ships flight path. The navigational deflector operates using two main components. In the first component the deflector emits a series of static low powered shields extending up to two kilometers in front of the ship. 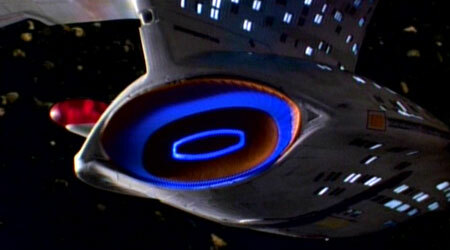 These deflector shields are designed deflect single atoms and other small particles from the ships path. The second component consists of a high powered deflector beam that is controlled by the long range sensors th at is used to deflect any large objects from the ships path. The deflector system has also been known to be modified to emit high powered tractor beams or as a high energy weapon.